Stock options values are expressed in abbreviated form, ie Stock Option Quotes. It is a good idea for option traders to understand how these ticker symbols are created and used as it act as a form of communication between the brokers and the traders. All the four elements must be present in order to distinguish one option from another. Options Clearing Corp, the world's largest clearing organization, implement the four elements symbol coding in the year 2010. This is to replace the outdated four to five letters option quotes that has little similarity to the underlying stock symbol. "The main goal is to bring clarity in what the option symbols actually represent through a coded description on what the underlying equity, its strike price and expiration represent in plain English," said Andy Nybo, head of derivatives at research and advisory firm TABB Group. Let’s look at the few examples below to illustrate how the symbols are shown. 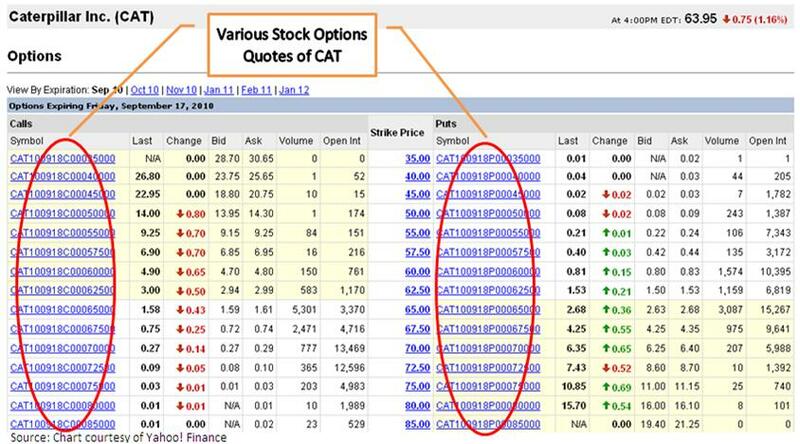 Below is an example of Caterpillar Inc. (CAT) with the various option quotes. Can you tell how the quotes are derived? After going through a few of the examples yourself, you should be more confident in interpreting the options symbols. However, it should be noted that the exchange (who designated the options symbol) need not adhere to any of the above generalized conventions describe here. They will usually adhere as much as possible so that the ticker symbols are standardized, but they can use whatever symbol that they designated. Therefore, for the most up to date stock options quotes, it is best to confirm again with your broker.